Game of Thrones is a wonderful, heartbreaking piece of television. But you know what would make it better? You guessed it — tiny, costumed, inbred dogs! Behold as some of your favorite Game of Thrones characters are transformed into tiny pugs. Do you think they ever hang out with Bane Cat or that Dog in Batman Pajamas? 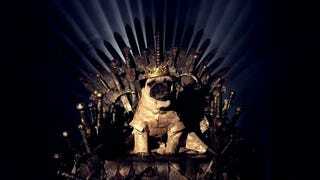 You know what they say — when you play the Game of Pugs, everyone wins.